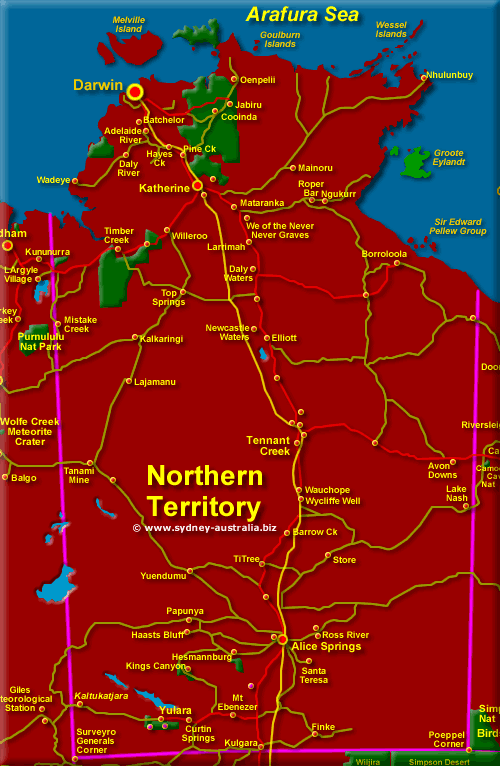 Tourist Map of the Top End of the Northern Territory - Towns and National Reserves and Parks. See more about the Northern Territory. The map shows the location of Darwin in the Northern Territory and various towns, including Jabiru, Kakadu National Park, Groote Eyland, Laguna, Tennant Creek, Barrow, Aileron, Alice Springs and Uluru (formerly Ayers Rock). From desert scenery to lush tropical jungle, visit the Top End of Australia. Take a fascinating Aboriginal ‘Come Share Our Culture’ tour while in Darwin, Katharine or Alice Springs, contrasted with the NT’s modern hotels, resorts and dining. See map of Darwin and Top End Darwin Surrounds NT Map. Next Picture: South East NT Map - South East NT Map. Previous Picture: North West NT Map - North West NT Map. Putting the NT into adveNTure.